Many years ago I wrote a tutorial on how to use an ArcGIS plugin to convert a transit agency’s GTFS package – a group of files that describe when and where their buses and trains stop – into files that could easily be manipulated by popular GIS desktop software. That was so long ago, before I became an expert in using QGIS, a free and open source alternative to ArcGIS. This tutorial will show you how to convert GTFS to a shapefile and to GeoJSON so you can edit and visualize the transit data in QGIS. First you’ll need to have QGIS installed on your computer (it works with Linux, Mac, and Windows). Second you’ll need a GTFS package for the transit agency of your choice (here’s the one for Pace Suburban Bus*, which operates all suburban transit buses in Chicagoland). You can find another transit agency around the world on the GTFS Data Exchange website. 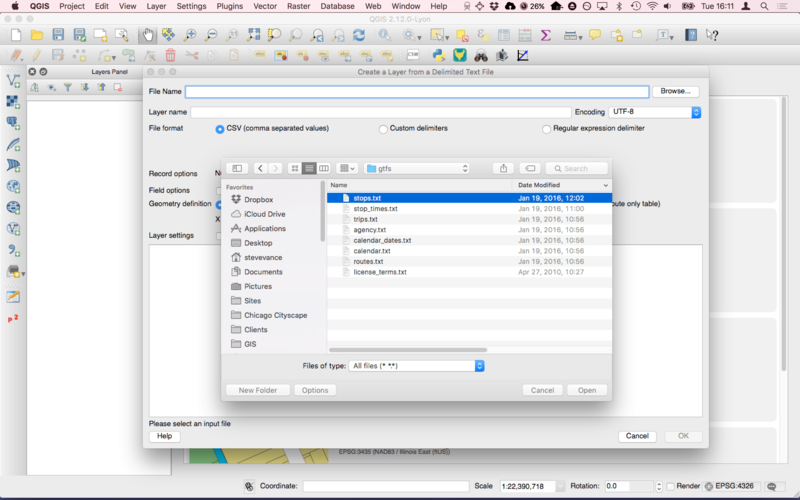 Load your GTFS data into the QGIS table of contents (also called the Layers Panel). Click Layer>Add Layer>Add Delimited Text Layer. You will be adding one or two files depending on which ones are provided. Now, here it can get tricky. Not all transit agencies provide a “shapes.txt” file. The shapes.txt file draws out the routes of buses and trains. If it’s not provided, that’s fine, but if you turn them into routes based on the stops.txt data, then you will have funny looking and impossible routes. Click on “Browse…” and find the “stops.txt”. 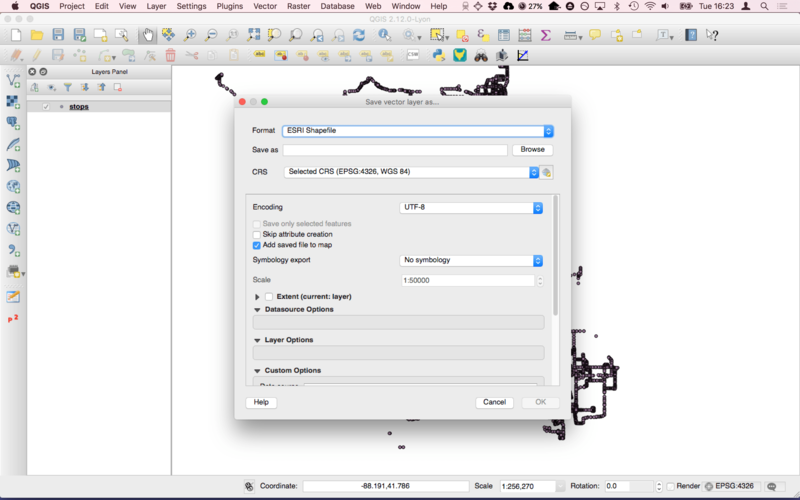 QGIS will read the file very quickly and determine which fields hold the latitude and longitude coordinates. If its determination is wrong, you can choose a different “X field” (longitude) and “Y field” (latitude). Click “OK”. A new dialog box will appear asking you to choose a coordinate reference system (EPSG). Choose or filter for “WGS 84, EPSG:4326”. Then click “OK”. 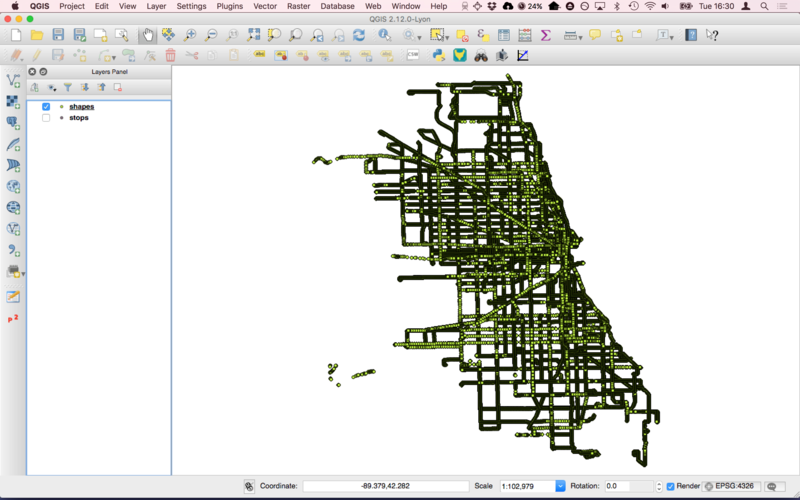 The Pace bus stops in the Chicagoland region are now drawn in QGIS! If the GTFS package you downloaded includes a “shapes.txt” file (that represents the physical routes and paths that the buses or trains take), import that file also by repeating steps 4 and 5. 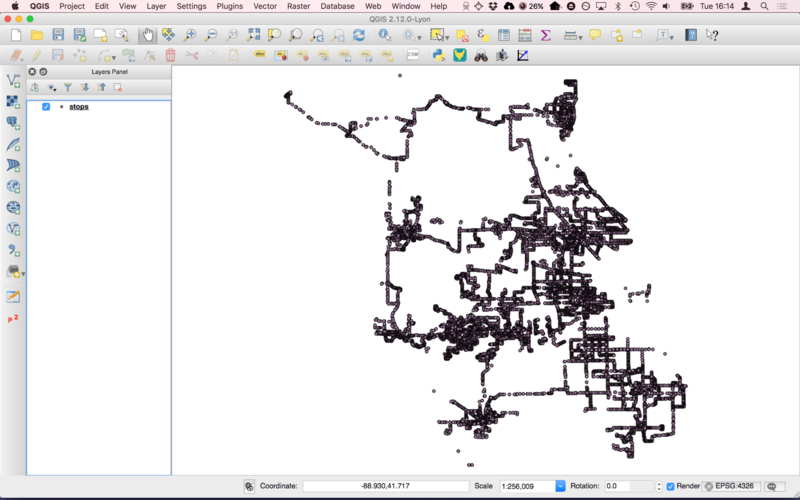 It’s really easy now to convert the bus or train stops into a shapefile or GeoJSON representing all of those points. 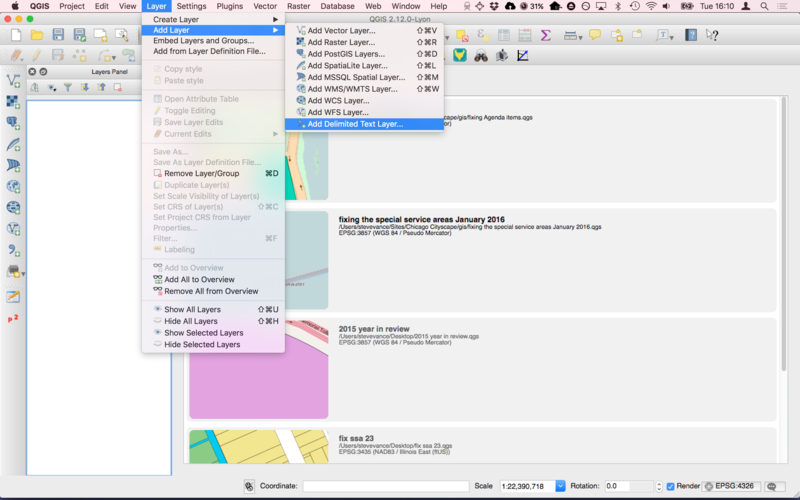 Right-click the layer “stops” in the table of contents (Layers Panel) and click “Save As…”. Then click “Browse” to tell QGIS where in your computer’s file browser you want to save the file. Leave the “CRS” as-is (EPSG:4326). Convert the Pace bus stops to a shapefile or GeoJSON. Then click “OK” and QGIS will quickly report that the file has been converted and saved where you specified in step 3. The “shapes.txt” file is a collection of points that when grouped by their route number, show the physical routes and paths that buses and trains take. You’ll need a plugin to make the lines from this data. Install the plugin “Points to Paths”. Click on Plugins>Manage and Install Plugins… Then click “All” and search for “points”. Click the “Points to Paths” plugin and then click the “Install plugin” button. Then click “Close”. 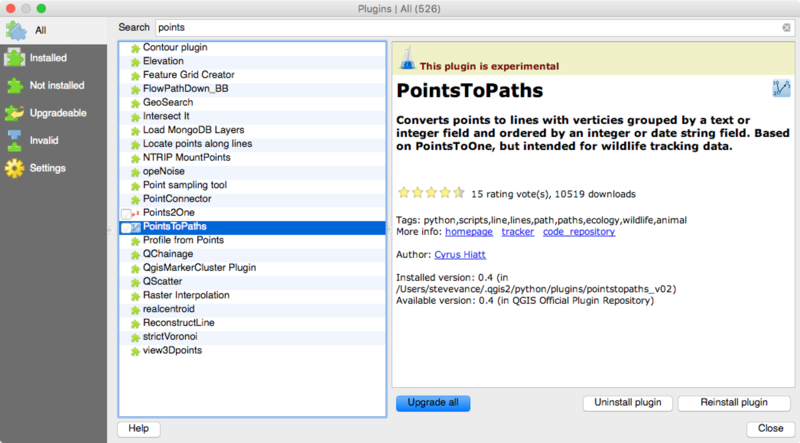 Install the Points to Paths plugin. Pace bus doesn’t provide the “shapes.txt” file so we’ll need to find a new GTFS package. Download the GTFS package provided by the Chicago Transit Authority, which has bus and rail service in Chicago and the surrounding municipalities. Load the CTA’s “shapes.txt” file into the table of contents (Layers Panel) by following steps 4 and 5 in the first section of this tutorial. Note that this data includes both the bus routes and the train routes. Now let’s start the conversion process. Click on Plugins>Points to Paths. In the next dialog box choose the “shapes” layer as your “Input point layer”. Select “shape_id” as the field with which you want to “Point group field”. This tells the plugin how to distinguish one bus route from the next. 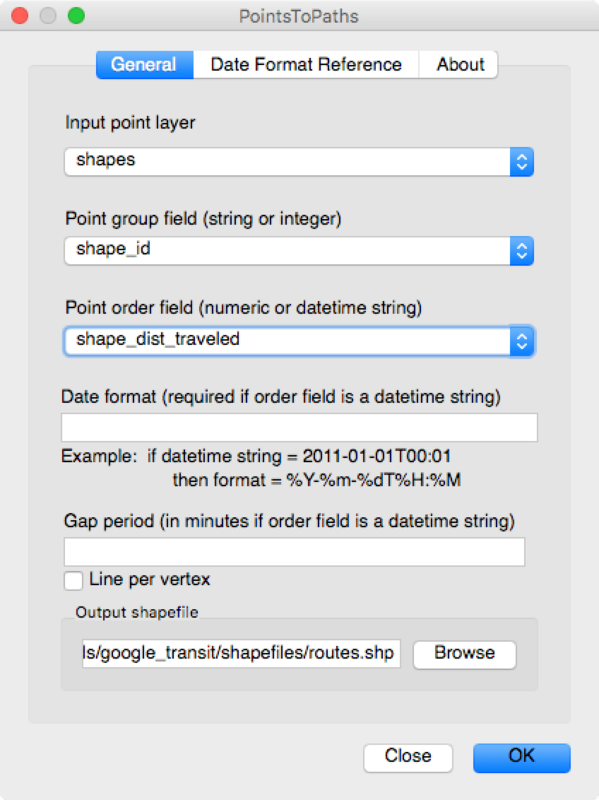 Select “shape_pt_sequence” as the field with which you want to “Point order field”. This tells the plugin in what order the points should be connected to form the route’s line. Click “Browse” to give the converted output shapefile a name and a location with your computer’s file browser. Make sure all of the options look like the one in this screenshot and then click “OK”. QGIS and the plugin will start working to piece together the points into lines and create a new shapefile from this work. These are the options you need to set to convert the CTA points to paths (routes). You’ll know it’s finished when the hourglass or “waiting” cursor returns to a pointer, and when you see a question asking if you would like the resulting shapefile added to your table of contents (Layers Panel). Go ahead and choose “Yes”. 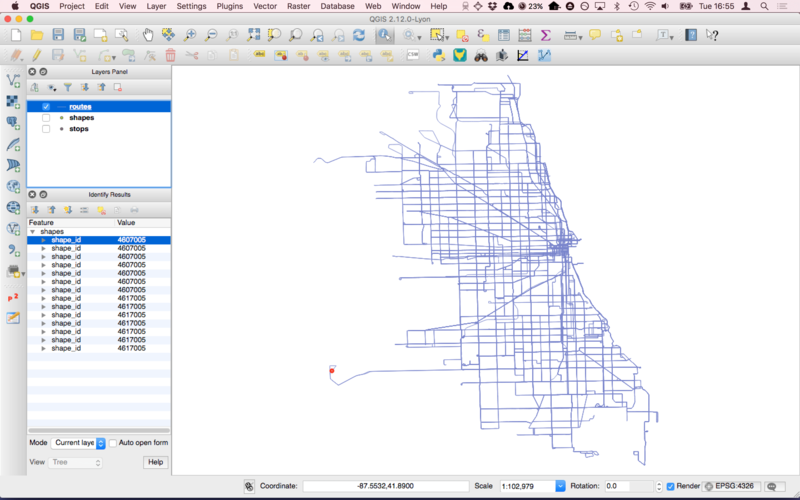 The CTA bus and train points, provided in a GTFS package, have been converted to paths (routes/lines). ** Choose GeoJSON if you want to show this data on a web map (like in Leaflet or the Google Maps API), or if you want to share the data on GitHub. We’re announcing our proposed 2016 budget today. Good news: we’ll continue to maintain/improve existing services and fares stay the same! The Chicago Transit Authority gleefully tweeted that “fares [will] stay the same” and they’ll continue to “maintain/improve existing services”. There are so many points to be made. The medium on which they sent this message is irrelevant because Mayor Rahm Emanuel will parrot this at his press conference this afternoon at the Addison Blue Line station. He’ll say something that he’s holding fares down in order to support working families, yet he (because he runs the agency) can still get projects done, like renovating the Addison station to be accessible. Fares should go up in increments smaller than quarters of a dollar! 0.25, 0.50, 0.75, and 1.00 are not the only choices available. Requiring riders who pay in cash – who become rarer each day – to pay with dollar bills and quarters isn’t a “convenience”, it’s annoying. It gives the CTA less flexibility in settling on the right price, and it means I can’t use these dimes and nickels that are piling on my nightstand. Quarters are for laundry. “Fares will stay the same” is what Emanuel said two years ago when the price of passes was increased. Apparently causing people to spend more money to ride the train the same amount of times, if they have passes, is not a fare increase. This year none of the prices are changing. Hiking pass prices and keeping the base fare (single rides + transfers) the same can still hurt a low income rider: it puts the discounted fare further out of reach. Many Chicagoans are unable to put down $25 at a time for a ticket that would pay for all of their rides that week, so they pay per use, and end up paying more. What holding the line on fare increases does is detrimental to riders and to CTA workers. It continues to defer fixing the problem of underfunded transit. The CTA, and its fellow transportation providers, Metra and Pace, are unable to pay for what people need them to do. Additionally it’ll mean that, in order to keep costs in check, the CTA might freeze wages again. Because professionals providing Chicagoans with quality transportation services are the city’s and state’s piggy bank, and should sacrifice their wages due to “hard times”. The governor and lawmakers in Springfield have not agreed on a 2016 budget and the state still owes the CTA $221 million in capital-improvement funding that was expected in 2015, transit officials said. But hey, “air quality” money is going to pay $18 million to widen a bunch of intersections so people can drive faster through them – until more people switch to driving through that fast intersection. A CTA rendering shows what a bypass track for Brown Line trains north of the Belmont station might look like, alongside a new residential building on Wilton Street. Ed. note: This is a guest post from Chicagoan Jacob Peters. “Keep the RPM Project on Track – Uncouple the [Belmont Bypass] Roller Coaster” is the tagline for a new website called “Coalition to Stop the Belmont Flyover”. Capacity is constrained at the Chicago Transit Authority’s Clark Junction track interchange (at approximately 3300 N Clark Street) which means that fewer Red Line trains can run than could be run if there wasn’t this conflict. In the same way there are opportunity costs in business, there are opportunity delays that are caused by this constraint on rail capacity. For example, if there was no conflict at Clark Junction, then five more trains an hour could pass through the Red Line subway. This would increase Red Line capacity by 25 percent during rush hour, and fewer passengers would be left waiting for a train to arrive with space for them to board. The way the website advocates against eliminating the bottleneck is hypocritical to the tagline of “keeping the Red Purple Modernization project” on track. That project, which would completely replace all track, viaducts, and embankments north of X station, and rebuild most stations (as well as widening and extending platforms) is largely based on a future service pattern that would run more and longer trains in the busiest transit corridor of Chicago. This capacity increase would reduce their average commutes by a few minutes. Since the trains wouldn’t have to be spread out in order to maintain gaps in service for the Brown Line trains that need to cross the Red Line at Clark Junction, average wait times between trains would drop all along the Red Line at rush hour, further reducing commute times. Lastly, when either the Brown, Purple or Red Lines are experiencing delays, and trains get bunched together, these delays ripple through the other lines. This happens because when a queue of delayed Brown Line trains are making their way through Clark Junction, Red Line trains must be held in order to let the delayed trains through the junction in an attempt to keep things moderately on schedule. If there was a bypass of this junction for northbound Brown Line trains, then a delay on either line would not affect the other. This would result in fewer days in which your commute is delayed. Future capacity needs and current delay reduction is what the Belmont Bypass attempts to address. There may be other ways to achieve this with other alternatives, but the bypass would be far and away the cheapest and could be implemented soonest. Unless you plan to propose alternative means of resolving these conflicts, and funding mechanisms to make them possible, you are not really advocating to keep the RPM on track. Because without untying Clark Junction there is no true modernization. The RedEye published on Monday an overview of the transit platforms from the two mayoral candidates that have made it into a runoff. (Mayor Rahm Emanuel didn’t receive a sufficient number of votes, 50 percent +1, in the February 24 election.) Chuy Garcia released his transportation and infrastructure platform about two days before the election. Garcia paints a beautiful transportation issues platform, but when faced with a truly transformative project he is unwilling to uphold his call for “reliable transportation”. I want to vote for him again, but if he keeps on watering down projects to a point of inefficacy then how are you going to convince anyone to expand transportation funding? How can I trust him to bring about the change is needed on other important issues if on the issue that he received a masters in, he is unwilling to apply best practices? Emanuel and Garcia should avoid grandstanding on issues of transportation because opposing a necessary transportation investment for political reasons is to let down the electorate that you are campaigning to serve. For both traversing Ashland Avenue by transit and riding Brown, Red, and Purple Line trains through Clark Junction, there is no way to move more people reliably through these areas without infrastructure improvements. Garcia shouldn’t oppose projects without explaining his alternate plan to address the same issues and achieve similar benefits – otherwise there isn’t leadership. There are few alternatives. First, you could study how to use the existing CTA land around the Belmont stop more efficiently and eliminate track conflicts. It would need to be studied whether a new northbound Brown Line track and platform just to the east and a few feet higher than the current track it shares with the Purple Line could allow for the Brown Line to get high early enough to bridge over the Red Line closer to School. This option would spare the buildings on the commercial thoroughfare of Clark, and focus demolition on residential streets. I am not sure if it is possible given how the Belmont station was reconstructed in 2009, but I don’t have a record of it being studied or laid out why it is not an option. Seeing as the anti-bypass group is claiming that the destruction on Clark would turn it into a “permanent under-El wasteland” I would think they would want to prove whether this is possible or not. Secondly, any alternatives analysis process [which the CTA hasn’t conducted] would include studying a subway alternative for this portion of the Red Line. In the RPM’s subway alternative there was no need for the bypass. The CTA considered a subway from Loyola station to Belmont station, but never studied each section of the potential subway separately. I truly believe that a subway with a portal at Clark Street and a portal just north of Irving Park Road would eliminate the property acquisition, station constraint, and construction phasing issues to outweigh the increased cost of going underground, without needing to consider a two-track alternative. There was a neighborhood proposal from the 1980s for a subway between Belmont Avenue and Irving Park Road which would act somewhat as a “flyunder”, so to speak. It would include a new Wrigley Field Station that could be built to handle more than the existing constrained Addison Red Line station, including a Purple Line stop in order to match the Purple Line limited service that stops at Sheridan that’s provided on select game days. The “flyunder” could allow the CTA to forego the large amounts of property acquisition that would be required in order to straighten out the kinks in the elevated north of Belmont, and to smooth out the curve at Sheridan. The CTA could then sell land currently under the tracks for development. In order to see if this is now feasible given the way Belmont was rebuilt, the CTA would have to study whether a bilevel tunnel from Clark Junction to Irving Park would be possible under Clark Street, and parallel to Seminary Avenue. There is also the alternative of proposing that eliminating the realignment of the Red Line, included in the Belmont Bypass literature, would be a way to eliminate the amount of buildings affected in the scope of the bypass. But I think that is somewhat tied into the discussion about the other two alternatives. The point is that the elevated bypass is a simple (although in the CTA’s current process, clumsy) solution to the question of how do you eliminate the Clark Junction bottleneck and the unreliability in the system that it creates. Jefferson Park train station rendering from the City of Chicago. The only difference you see is canopies. What you don’t see is a walkable connection ut thisetween shops southeast of here and the train station – they’re separated by a strip of parking. Plans for the renovation of the Jefferson Park CTA station are illustrative of the City’s failure to think deeply about how to design the projects that is funding in a way that maximizes potential for residential and commercial development around train stations. 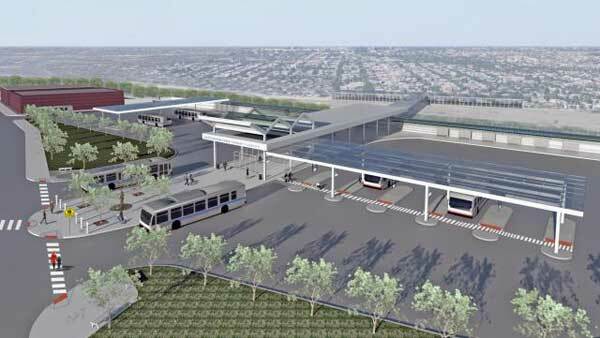 The changes proposed for one of Chicagoland’s most important transit centers are weak. There’s no development plan, or any kind of neighborhood plan or “Corridor Development Initiative” for the Jefferson Park transit center. Current city policy identifies train stations as optimal places to build new housing and commercial uses. Without challenging the design to respond to this policy the transit center will continue to use neighborhood space inefficiently and doesn’t respond to demands from residents to improve pedestrian and bicyclist safety and increase economic development. Judging by the renderings, nothing is changing at the Jefferson Park Blue Line station (4917 N Milwaukee Ave). All of the improvements save for the canopy are invisible in this rendering. The CTA’s list of improvements reads like the superficial makeover that many stations got in the Station Renewal program almost three years ago, a stopgap measure until Your New Blue could begin. There will be LED lighting, new paint, new escalators and stairs, new paving, and a new canopy. Only a few of those things make the station easier to access and use. On Twitter I said that the station should be surrounded by buildings, not bus bays. I’m not familiar with how many routes and buses use the station daily, and I’m not suggesting that space for buses go away. I’m challenging the Chicago Transit Authority and Mayor Rahm Emanuel to come up with a better plan for vehicle and pedestrian movements, and to start welcoming new development. I pointed out the new Wiehle-Reston Silver Line station in Virginia where a residential building was constructed atop a bus bay (where I transferred from the Washington Flyer bus from Dulles). A plaza connects the bus bay to and apartment lobby and the Metrorail station. The bus bay at the Wiehle-Reston Silver Line station in Reston, Virginia, is under an apartment building and plaza linking it to the Metrorail station. The Metropolitan Planning Council conducted a consultation for the Logan Square Blue Line station – Your New Blue will make upgrades here, too – and the next door city-owned parking lot. Their consultation involved 700 people to decide what development at this station should look like. Their desires were pretty specific: there should be affordable housing, but not any higher than six stories. The current policy, enacted as an ordinance and expressed in other city documents, allows developers to build more units in the same plot and save them and their tenants money by building less parking. But this policy is insufficient in that has no design review or public consultation attached. It also provides no zoning recommendations to expand the number of places to which it can apply. The city’s recent choices for development and (lack of) urban design at this station as well as across from the Halsted Green Line station in Englewood where the city is selling vacant land to build a Whole Foods-anchored strip mall demonstrates how little deliberation there is in maximizing transit-oriented development, or TOD. Their suburban forms are the antithesis of how we should be designing the stations and their environs – they should have higher densities and walkable places. * Metra has published its 2014 station-level counts! This station had 599 daily boardings, yet not every train stops here. The Union Pacific Northwest (UP-NW) line that stops at Jefferson Park saw a 3.8% increase in ridership [PDF] from January to September 2014 versus the same period in 2013. ** There are no parcels near the Jefferson Park transit center that allow the transit-adjacent development ordinance to take effect; developers have to go through an arduous and sometimes costly process to persuade the alderman to change the zoning. The ordinance only affects Bx-3 districts (where x is 1-3 and -3 is the allowable density identifier). There used to be a Max Gerber plumbing supply store here that the absent landlord demolished to reduce his property taxes. A developer has proposed built 254 units in two towers here, in spitting distance from the CTA’s 24-hour Blue Line. Developer Rob Buono has proposed two towers for a vacant property 400 feet away (walking distance) from the Chicago Transit Authority’s California Blue Line station. It has caused quite a stir in Logan Square about how much development is the right amount, and brings into question residents’ understanding of how the neighborhood demographics have changed. It has also brought “TOD” into the local conversation. Buono will get some relief from exceptional car parking requirements because of the land’s proximity to the ‘L’ rapid transit station. The process will be a long one. The first meeting, called by Alderman Moreno, was held on Thursday night. I counted over 70 people on the sign-in sheet when I came in, and many people arrive after so saying 100 people were there isn’t a stretch. Moreno described his development policy: whenever they need a zoning change they must present their proposal to the community so Moreno can get their feedback. Before Buono spoke, though, Moreno asked Daniel Hertz to briefly talk about transit-oriented development and why the development (or at least the number of units and car parking spaces it proposes) is a good project for this place, and in this neighborhood. In balancing concerns about car traffic, keeping people close to the services and products they need, and making it easy to get around, it makes the most sense to put the highest number of housing units in close proximity to high-capacity transit versus anywhere else. Essentially, Logan Square has lost residents – 10,000 people since 2000 – concentrating the burden of patronizing local businesses, seen as a distinguishing asset in the neighborhood, on fewer people. Additionally, adding housing is the best way to combat rising home prices (and unaffordable rents) by offering more supply which reduces demand on richer people buying, converting, or tearing down existing buildings. While no building permits will be issued for the towers until Ald. Moreno, Plan Commission, and City Council approve the zoning change, you can track what other kinds of buildings developers are building in the area surrounding 2293 N Milwaukee on Chicago Cityscape. You’ll see quickly that a majority of the projects permitted this year are for single-family houses. Some of these are built on vacant parcels while at least one is being built where there was previously a multi-family house. At this rate, Logan Square may grow at an extremely low rate – these homes will likely be filled with small families. The decreasing household size is another factor in Logan Square’s population loss. 1st Ward Alderman Proco “Joe” Moreno gracefully – given the circumstances – moderates the meeting. The gutted cold storage warehouse in the background is within a quarter mile of the Morgan CTA station. Photo by Seth Anderson. Excluding all of the Chicago Transit Authority stations in the central business district you’ll find that the new Morgan station ranks highly in the number of building permits issued within a quarter mile. It has a top spot when you calculate those permits’ estimated project costs. The CTA recently discussed with DNAInfo the results of a preliminary study it conducted that showed how the Morgan station is at the center of a lot of construction growth in the West Loop/Fulton Market area, and a contributing factor to this growth. Now that Licensed Chicago Contractors shows you the two nearest CTA and Metra rail stations to each building permit, and I’ve become well-versed in writing PostGIS queries on the fly, I wrote a query that lists the CTA stations with the most building permits within a quarter mile (“nearby”). First, though, let’s count how many stations don’t have permits nearby. With the query at the bottom you get a list of station names, the number of permits nearby, and a sum of the estimated costs of those permits sorted by the number of permits. Since I used a “LEFT JOIN” I also get a count of all the permits (the table on the LEFT) that don’t have a match with CTA stations (the table on the right). There are 127 rows returned and a previous count of the table told me there are 145 stations, including ones outside the Chicago city limits. (There are stations in Cicero, Wilmette, Evanston, Rosemont, Oak Park, Forest Park, and Skokie.) The first row represents NULL, or all of the stations that don’t have permits nearby. That leaves me with 126 rows and 19 stations without permits, or 19 stations outside the City of Chicago. I verified this by eyeballing it. I looked at a map and counted roughly 19 stations that wouldn’t have the 1/4 mile overlap with a Chicago building permit. The two Austin stations, on the Blue Line Forest Park branch and the Green Line Oak Park branch, are near Chicago and also showed up as a discrete station in the query results. Austin on the Blue Line was dead last, actually! Let’s get back on track and look at Morgan now. I don’t think it’s fair to compare the Morgan station area with an expected, higher-activity area like the Loop and Central Business District so I eyeballed the list and started the #1 ranking with the first station outside the CBD. Armitage (Brown, Purple Express) is the station outside the CBD with the most building permits nearby. There you have it, from 2009 to today, the Morgan station had the fifth highest number of building permits outside of the Chicago Central Business District. It beat Fullerton (Red, Brown, Purple) in Lincoln Park, and Roosevelt (elevated and subway combined) in the South Loop. The station’s construction began in 2010 and the grand opening occurred May 24, 2012. During this period Morgan had the second highest amount of aggregated estimated costs at $199,911,953.00, behind North/Clybourn, at $218,118,037.37. Take this analysis with several grains of Morton salt, though, because the following caveats are important to consider: building permits are really speculative development; much of these may be for kitchen renovations or porch reconstructions; I didn’t look up when it was “for sure” that the station was being built so I don’t know when developers would have become interested. I will, however, run a few more queries to find how Morgan’s position changes, starting with expanding the query to “all time” data (really the end of 2006 to today). It turns out that when looking through all available years Morgan’s position remains at #5 but other stations change position. During this period, which covers the end of 2006 until today, Morgan had the highest aggregated estimated costs of the above five stations, at $236,707,083.00. It beat Fullerton’s amount of $160,825,680.30. Let’s remove that date filter and look at the whole building permits period of late 2006 to today. Now switching the order method around and Morgan appears better when you look at aggregated estimated costs, from 2009 to today. Last query – remove the data filter and look at aggregated costs for the whole building permits period where Morgan maintains a top 10 position. The data I’d really like to have, though, is sales tax receipts for the same years. This is not a valid PostgreSQL query. The brackets indicate the options I was using to retrieve the above results. The geometries are in or transformed to EPSG 3435 (Illinois StatePlane East Feet) and 1,320 feet is a quarter mile. Buildings on corners should have corner entrances or minimally deviate. The residential building on the northwest corner of Milwaukee Avenue and Halsted Street was built in 2003 with a first-floor commercial space with an entrance on the Milwaukee Avenue side. Normally this wouldn’t be such a big deal – Milwaukee is a busy street and this side of the street has a fair amount of foot traffic. But the other side of the building, on Halsted Street, faces one of two entrances to the Grand Blue Line subway station and a major transfer bus stop. 7-11 is moving into the building and have built a new entrance out of the corner space with floor-to-ceiling windows. Now it’ll be much easier for transit riders to get to a convenience store. The other advantage is the added visibility: seeing the entrance from far away, from all sides, saves milliseconds in our internal GPS processing time – make a bee-line to the entrance instead of “hunting” it down after you make your way in the general direction of the building. * You can see that there’s a step here so it’s not currently accessible. Originally this wasn’t the entrance so that makes sense. I don’t know what these contractors are doing but 7-11 must make the entrance accessible.